A Tokyo Night Walk. My Tokyo neighbourhood is full of intrigue. Not one for confined spaces at night I like to take to the by-roads of my surrounding area and learn something new. For example, the location of an interesting cafe, a new noodle bar or some drinking establishment. Invariably, I return home with some inspiration or other but as of recent have taken a liking to figuring out the meaning of the posters along my ambling routes. I am referring to the genuinely bizarre and sometimes riveting posters that I come across on these walks. Japan has long been known for its wacky & weird TV commercials but this is an offline tour. What I discover on my night walks is perhaps the underbelly of advertising with messages not necessarily aimed at the mass market. Without a certain knowledge of Japanese however many of these posters wouldn’t attract a second glance and I admit freely that my reading of them may not be perfect. Nonetheless I’d like to share some of the recent ones I’ve stumbled on! Take this dog for example. A keen sense of smell? 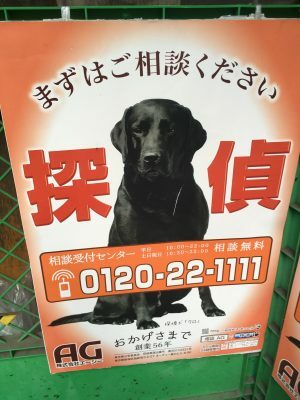 This black lab retriever sits proudly emblazoned with the message- DETECTIVE. Now that kind of makes sense when you think of this dog’s loyal & reliable character but it gets a bit more baffling when you throw a monkey into the works. Meet Detective Dog’s partner in crime..eh… Constable Chimpanzee?! 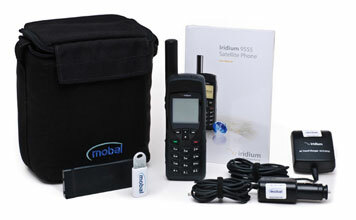 Call us now if you have a monkey on your back….! So the mystery deepens. 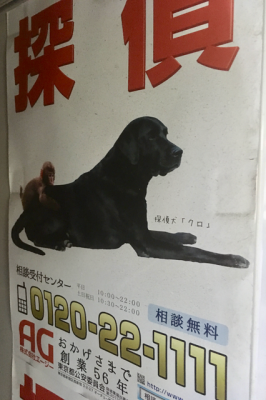 Why would anyone advertise for detective services by placing a monkey on a dog’s back? My own guess is that it the meaning comes from the Japanese expression Ken-en no naka (犬猿の仲）- the Japanese equivalent of “to fight like cats & dogs” but in this case like monkeys & dogs. Maybe I need to hire a detective? I snapped this poster without fully understanding the message it carried. The lady in kimono dress seemed wistful and missing a smile. Now I know why.! The words writ large on the right mean “We will get you back!”- a reference to the efforts of the Japanese government to get back citizens abducted by North Korea between 1970 to 1980. 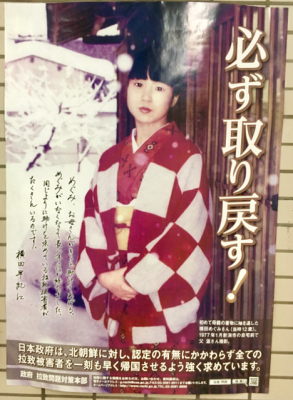 There are at least 17 cases of known abduction of Japanese citizens – some of which were acknowledged by North Korea who in 2002 returned 5 of the lucky ones. But the problem still festers. Clearly the Japanese government are not taking this lightly & their poster campaign is complemented by a strongly worded website in 9 x languages. 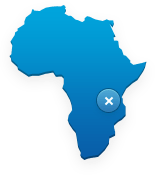 The below image is available as a download on the government’s official website. 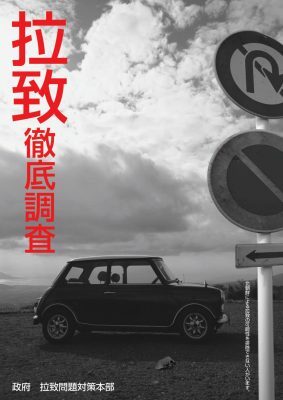 I will supply the text but I imagine the meaning is crystal clear.The large red script reads “Investigating Abduction Incidents Thoroughly” and to the right of the empty car are words indicating that other cases where citizens have disappeared have not been ruled out as abduction by North Korea. 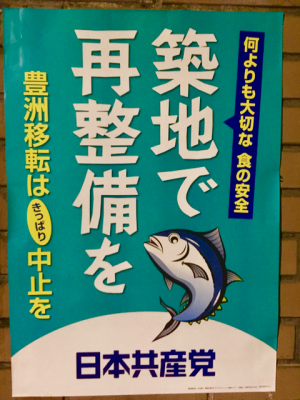 We’ve had monkey business but now we’ve bumped into a campaign from the Japanese Communist Party who are against the re-location of the dilapidated Tokyo Fish Market in Tsukiji to a new purpose-built location in Toyosu. Tokyo Fish Market- Smack DAB in the Middle of the City! At least for now.. The move which was due to take place in 2016 is now on ice as groundwater on the new site was found to be contaminated. A Red Revival in my Neighbourhood? I don’t think I live in the middle of a hotbed of revolutionaries. It’s not unusual in Tokyo neigbourhoods for people to keep themselves to themselves. But there are quite a lot of Communist Posters. Should I be worried? Let’s see. The Japanese Communist Party is one of the largest non-governing communist parties in the world and does not advocate for violent revolution. Furthermore they wish for Japan to apologise for its actions in World War 2 and also to terminate the Japan-U.S Military alliance. As the below poster shows they also defend Article 9 of the Japanese Constitution! 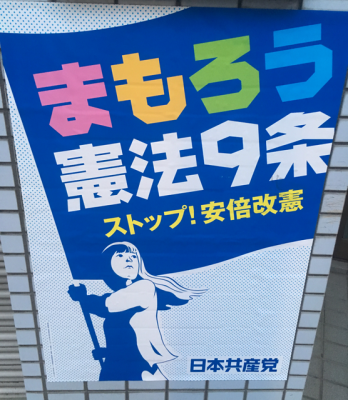 The yellow text on the bottom translates as “Stop (Prime Minister) Abe Amending the Constitution. So What is Article 9? Article 9 outlaws the use of war as a means to settle international disputes. Written into the Japanese constitution post war it simply meant “never again” and helped Japan gain trust in the region and build a reputation for being a peace-loving country. Since then the interpretation of the law has slipped slightly with the condition that Japan may not hold land, sea or air forces being circumvented by the creation of a Self-Defence Force. By 2015 Japan was ranked 8th in the world for military spending. The current Prime Minister Abe wishes to get rid of Article 9 and the nation is split between those who see China’s military expansionism and North Korea’s missile tests as reason for change. In the other camp are those who advocate for keeping Article 9- that includes the Japanese Communist Party who want to make Japan a non-aligned and neutral country. Again I admit to not getting this poster at first glance. I saw a Japanese lady in the middle of a bunch of foreigners and it all looked rather playful. As I’ve come to learn however – expect the unexpected. In the middle is Setsuko Thurlow, a Hiroshima survivor. Only 13 when the A-bomb dropped on Hiroshima she tells a harrowing story of personal grief on that day. And ever since she has been at the fore of the movement to ban nuclear weapons. In July this year (2017) she succeeded when 122 U.N countries signed a treaty banning nuclear weapons. Only Japan was not there. Strike anyone as odd that the only nation to have been attacked by nuclear weapons did not sign up? 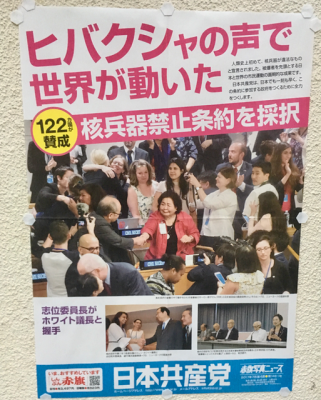 The poster below is an image of Setsuko being welcomed at the UN in New York. While the JCP advocate for signing the treaty the Japanese government refuse to do so acknowledging tacitly Japan’s protection under the U.S nuclear umbrella. In addition, they claim that the exercise is pointless without the participation of countries possessing nuclear weapons. I listened to Setsuko speak online and it’s hard not to come to the conclusion that the Japanese government have put themselves on the wrong side of history from a moral stance. Do governments have morals? TPP- Was Japan Almost Destroyed ? I needed to relax after my evening walk so as soon as I returned home I went to the official homepage of the Japanese Communist Party (whose posters I quite admire) to see what other issues might be rankling them. 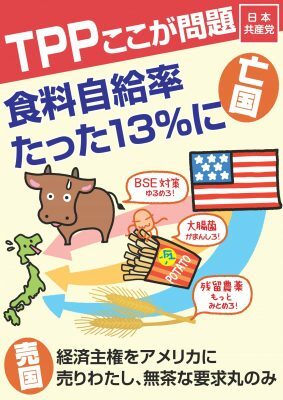 The JCP claim that the dreaded TPP will not only destroy Japan’s food sovereignty but also it’s food safety and the poster quotes a figure of future food self-sufficiency of 13%! The Nervous Cow- represents a slackening in BSE regulations. The Fallen Stalks of Wheat- represent an increase in residual pesticides. The American Flag- guess who’s being blamed? 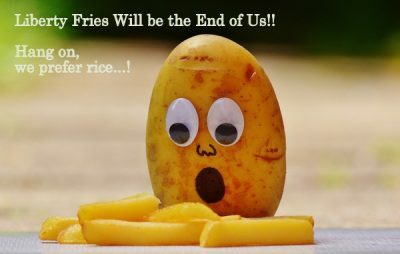 What’s the Problem with TPP? Until the 23rd January 2017 the Trans-Pacific Partnership was the largest trade agreement in history. If signed it would have heralded a free trade area accounting for 40% of the world’s GDP. The Japanese Communist Party were concerned signing the TPP would sell off Japanese people’s interests to U.S & multinational corporations. And then Donald Trump happened. The Saviour of the Japanese Communist Party? 10 years of behind the scenes work were undone by President Trump within 100 hours of taking office. In January 2017 an executive order was signed and the withdrawal of U.S participation effectively put an end to the TPP in its current guise. Guess that means it’s ok to eat burgers and fries again. Although I’m not so sure I should take more walks in the evening. 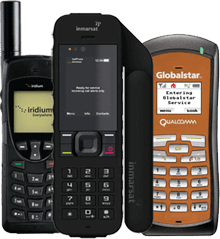 « 2G or not 2G – that is the question!